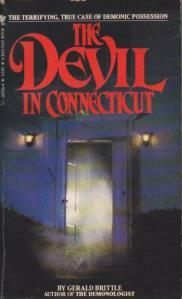 You can’t believe everything you read.That’s one of the first tenets of critical thinking.This whole process is about how to get to the truth, and in a materialistic world that truth can’t involve anything supernatural.These were my thoughts upon finishing Gerald Brittle’s The Devil in Connecticut.Controversy accompanied Ed and Lorraine Warren’s investigations and some of the people involved in these cases have later claimed the extraordinary events didn’t happen.Others claim that the Warrens offered them to make lots of money by selling their stories.The effect of reading a book like this is a blend of skepticism and wonder.Among their fans the Warrens are held in the highest regard.Anyone who begins to look into their work critically ends up frustrated. So when I put this potboiler down—it is a compelling read—I went to the internet to find out more.Then I realized what I was doing.Using the internet?To find the truth?It’s a vast storehouse of opinion, to be sure, but what with fake news and alternative facts who knows what to believe anymore?I found websites debunking the whole case as a hoax.Others, naturally, claim the events really happened.Both kinds of web pages have the backing of someone in the family involved.It’s a pattern that follows the Warrens’ work.In one of the many books I’ve read about them they claim to have ten books.If my math is right this was number ten.Even that remains open to doubt. The word “hoax” seems a bit overblown.Dysfunctional, maybe, but hoax?Reading Brittle’s account it’s clear there were some issues in this family.Having grown up in a working class setting, I’m aware such scenarios are extremely common.Accusations were made that this was an attempt to spin gold from straw.The nearly constant stress of blue collar families makes that seem less far-fetched than a stereotypical devil showing up in a modern house because a satanic rock band placed a curse on the family.Lawsuits—the most avaricious of means for determining facts—apparently prevented a movie deal and have even made this book a collector’s item.Somebody, it seems, is making money off the story.As after reading the other nine books, the truly curious are left wondering.My skepticism kicked in early on, but then again, I’ve always liked a good story.